Come experience a compassionate, truthful and healing way to work with the energy of money. This workshop offers you an honest, open discussion about money and the role it plays in our lives. What are our unconscious attitudes and beliefs preventing us from feeling empowered in our finances? This 4 part series will be taught in a down to earth, easily digestible format. Those who attend will walk away with a comprehensive understanding of how to save, invest, evaluate risk and plan their future. Come explore your personal relationship with money and how to make it more financially rewarding. With Joanne Leffeld, The Moolah Doula. This workshop gets to the bottom of emotional blocks, unconscious spending, overwhelming debt and the shame and fear that most millennials are plagued with. In this thought provoking workshop, come explore your personal relationship with money and how to make it more financially rewarding. Through experiential exercises and dialogue, participants will reflect on patterns, beliefs and self-limiting thoughts holding them back from attracting more prosperity into their lives. I will be returning to Wyld Womyn in Beacon for a truly one of a kind evening of deep exploration, grounding prosperity meditation and helping participants create a concrete plan for developing awareness and intention in their relationship with money. Stay tuned for details and a flyer soon! Please join me at the library for an exploration into understanding how our underlying beliefs and behaviors around money prevent us from creating abundance in our lives. We got such great feedback from the first workshop this Spring and I've been asked to offer another one. If you weren't able to make it then, don't miss this one! Now more than ever before is the time to heal your relationship with money. Come for an afternoon of deep exploration, compassionate listening and leave with powerful tools to transform your relationship with money. I will be presenting a workshop at this event. Last year's fair had amazing practitioners, bodyworkers and an incredible range of products. Hope to see you there! I am so honored to have been asked to participate in an evening's discussion concerning consciousness and one's relationship with money. I am sure the conversation will be lively and thought provoking. Details about the location to follow. Please join us! Within the Rondout Valley Holistic Health Community, healthcare takes body, mind, emotions, and spirit into account. As health issues are addressed, individuals play an active and responsible role in the healing process. To help community members learn how to help themselves, we offer a series of monthly classes in holistic self-care. Your body knows how to heal itself when given the proper support. Come and learn a variety of methods to support your own well-being. See www.RVHHC.org. In this class, Joanne will take you on a journey to uncover unconscious attitudes and beliefs that could be limiting your sense of abundance and security. What hold you back from letting go of the fear of never having enough? Learn all about financial tools in a compassionate, non-judgmental and simplified way to help you make financial decisions. Come explore, learn and get empowered in your relationship with money. Joanne Leffeld began her career as a Certified Financial Planner working in the New York Metropolitan area. After several years, she moved to the Hudson Valley, joining her husvan in building their lighting design company, Ledspin. Joanne has created a unique business using a holistic approach to money. Her primary goal is to educate and empower clients. She genuinely believes anyone is capable of making intelligent financial choices when given proper tools and knowledge. She endeavors to remove shame, fear and feelings of ignorance about financial matters. Joanne refers to herself as the “Moolah Doula”, helping people give birth to a healthier relationship with money. It's official! The talk at the Saugerties Library is on March 31st which will hopefully be after the last snowfall! Hope to see you there! In this thought-provoking workshop, Joanne invites us to explore our relationship with money and how to make it less intimidating, more honest as well as financially rewarding. As independent women, we want to see our money working as hard as we do. The first step towards a healthier relationship begins with identifying one's underlying beliefs and self-limiting thoughts. Through experiential exercises and dialogue, participants reflect on these long held behaviors holding them back from attracting more prosperity into their lives. Participants will also learn tools about saving, investing and planning for the future. Come join me and the Hudson River Exchange for an afternoon exploring how to improve your financial relationship and make 2018 the best year yet! Come join me at this magical retreat center in Accord for an intimate and compassionate workshop about why our relationship with money is so troublesome and how to heal it. Iris is a unique center where community comes together to heal and love. I am really looking forward to gathering with women who want to explore and heal their relationship with money in this new workshop. It will be an unforgettable experience! I will be returning to the Hasbrouck House Market to offer complementary mini sessions to anyone interested in improving their relationship with money. I hope to see you there! I am so excited to be offering a talk and complementary sessions at O+ this year! My goal is to empower every artist interested in improving their relationship with money. I hope to fill the house! In this thought-provoking workshop, we will explore how we create our personal relationships with money and learn how to make them more financially rewarding. 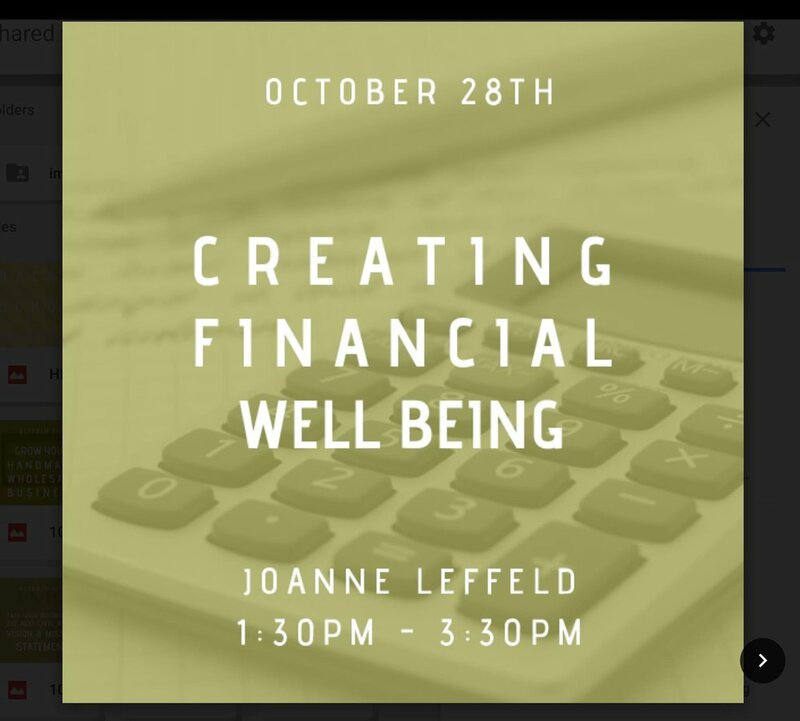 The Moolah Doula, Joanne Leffeld will offer creative approaches to improving your financial future in this exploration about the meaning of money and how we relate to it in our lives. Experiential exercises invite participants to reflect on patterns, beliefs and limiting thoughts holding us back from attracting more prosperity into our lives. This workshop includes small break out sessions to reflect with one another on personal stories and discoveries. By learning to shift one's limiting beliefs, financial abundance can be cultivated. This workshop is open to men and women of all ages desiring a deeper level of consciousness with the energy of money. Attendees will also receive a gift of a complementary 1/2 hour phone consultation with Joanne. I will be offering complementary mini sessions at Woodstock Healing Arts. Please stop by and say and receive personal advice on how to improve your relationship with money. Market at Hasbrouck House - 1:30-6:00!!! Come visit me at the Hasbrouck House Market to receive a complementary mini-session. I will be offering moolah doula sessions from 11:00 to 4:00. I look forward to seeing you there! This is an event you won't want to miss! I will have a booth at this year's festival from Saturday to Sunday. Please stop by and say hello! Please join us at Woodstock Healing Arts for an evening of exploration into our relationship with money. Joanne will present an introductory workshop exploring how our early childhood experiences around money impact our adult lives. Uncovering self-limiting attitudes and beliefs are a key step towards creating more abundance and prosperity. This workshop will be interactive, playful and filled with compassion. Participants will leave with powerful tools to remove blockages while learning foundational building blocks to create financial success. Thanks to a grant from the Maya Gold Foundation, I am offering this workshop for teens.